Despite positive projections for the coming year in terms of overall sales and growth, West Michigan manufacturing executives say they are feeling uncertain. Their concerns range from how the ongoing implementation of the Affordable Care Act (ACA) will affect their businesses to the squeeze for skilled workers and the forecasted capacity constraints in sectors such as the automotive supply chain. The result: When possible, they’re being more selective in deciding which contracts to sign and which customers to work with. MiBiz sat down with executives from a range of manufacturing sectors to find out what they’re watching and what could be keeping them up at night throughout 2014. Steve Beurkens, West Michigan account manager, Major Polymers Distribution Inc.
Bob Buist, president, D&M Metal Products Co.
Mark Lindquist, president, Rapid-Line Inc.
Rick Mellema, vice president and CFO, ESCO Group Inc.
Mary Ellen Mika, manager, sustainability and energy supply chain management, Steelcase Inc.
Keith O’Brien, vice president of global operations, Pridgeon & Clay Inc.
How are manufacturers handling health care costs and the unknowns associated with the implementation of the Affordable Care Act (ACA)? Nesky: We are directly impacted in at least two ways. Aside from obligations to provide health care for our employees, we are coming under increased regulation from the Food and Drug Administration. (Keystone is a developer of medical devices and is a member of the West Michigan Medical Device Consortium). Everyone we interact with is in a state of unknown. … It used to be pretty clear who was paying for things. Nowadays, you don’t know who your customer is. Keystone’s customer base could be the end user, it could be the government, it could be the organization they are consulting for, or all of the above. Mika: (From an employee perspective at Steelcase), we recently received a notice that said the projection was worse than the reality. We thought the costs would be higher than they were and the effect on employees is just a 1-percent increase. Mellema: We are right at the 45-employee mark. I’m consciously aware of the fact that (if we add) a few more employees, we are going to have to get into the government reporting and other obligations. But we have a union shop and they have a Taft-Hartley plan with the Michigan Teamsters. I’m not concerned about that because we locked in our rates when we negotiated for the next three years, so those regulations are their problem, not ours. But the other thing I am discussing with our insurance folks is a self-funded route. Buist: We are right at that (50-employee) mark. Some weeks we are 51 or 52, and other weeks we are 48 or 49. What we have been confronted with is if we don’t stay above 51 employees over the next year (in a 12-month calendar period), our rates will go up 40 percent. … We have to figure out if we hire two people just to effectively have them stand there and then save hundreds of thousands of dollars. It’s ugly. Lindquist: We have been waiting for our quote for five months from the insurance company. Potentially our insurance costs are nearly doubled. That would be an extra $400,000 bill, if everyone signed up. The sense I have gotten, and I think it’s the crack in the Obamacare program, is that lots of young people are not signing up. I don’t think we will get the $400,000 mark. We will continue to do the self-insured thing, which we have done for a number of years. Hopefully, we will soon get an idea of what is going to happen there. O’Brien: At Pridgeon & Clay, we’ve got 850 employees in West Michigan and another 100 in Indiana. We are self-insured so there is less of an impact on us now. We have done surveys in the last 12 months to verify that they are actually married, that their children are actually their children. We found that 76 of our participants had people on the plan that shouldn’t have been on the plan. The big thing for us is that we actually reduced our health care costs on a per-participant basis by 3.68 percent over the last year. We’re really trying to focus on wellness programs and promoting that internally. … More for us though, the thing we are concerned about is whether the hours considered part-time are going to change or not. One thing (the government) is looking at is pushing that 29- or 30-hour mark up. For us, that would be positive. We employ a lot from local colleges, especially in our distribution center. Twenty-year-olds enjoy having an afternoon or weekend job and it’s a challenge for us to keep those hours at 29 hours or less. Mellema: (The ACA) isn’t really going to impact our business. It means that a few of us are going to be paying much more attention. We are going to make it work for us and for our employees. It is just one more administrative task we need to have smart people paying attention to. It’s no secret that you’re all struggling with how to access a qualified workforce, particularly with skilled workers. How are you dealing with that? Beurkens: Everybody that I talked to over the last five or six years, whether it’s manufacturers or service-oriented companies, all say the same thing. Their biggest problem is finding people who want to work and finding people who are capable of working. Across the board, that’s what they will say. Out of 10 people that would apply for positions, only one of them you would even take a chance on hiring. Small: One company I’ve been working with is looking for 42 people right now, all skilled. We are working with Michigan Works! and the community colleges and Ferris State University to just try and get the message out there and hold a job fair. In my career, for somebody to be looking for 42 skilled workers is unprecedented. It’s just one company and they are in Ionia, which is not like a Grand Rapids. They don’t have that base of employees. It’s tough out there. O’Brien: One out of every 10 resumes will actually turn into a reasonable hire and even then it’s a crapshoot if that person passes the 90-day mark. Plus the … training development process is so expensive and can be so detrimental with the mistakes an employee can make. … We can’t go through the recruiting and onboarding process and then find out that there was a red flag we missed. You cannot be wrong. We are measuring and using corrective action processes — like you would for defective parts going out of your business — for the recruiting process as well. If an employee comes in and doesn’t work out as intended, it is a full corrective action process of what went wrong so that we can learn from it. In light of the workforce issues, what are your companies doing to train more workers? O’Brien: (Pridgeon & Clay) is starting to see an upswing in high schools and technical centers supporting shop classes and other programs to train students, particularly on the lakeshore. Schools are partnering with companies because the schools don’t have the funding for the equipment. (That training) is great because you (can pair up youths with veterans) and they get started at a young age. But you’re dedicating your resources to it … or you have to bring people on (and) that’s what they are specifically focused on. Lindquist: The skills have changed and machines are easier to work with. (Workers) are good with their thumbs (on a smartphone) but they’re not real good with a wrench. We have to deal with that new reality. We are trying to make it simpler for a person to walk in off the street and contribute. … Like many, we are training more than ever. We have a program where we send some of our employees to get associate’s degrees. I never envisioned I’d be doing the G.I. Bill at Rapid-Line, but I guess that’s what we are doing. It’s mostly out of self-preservation because you need fresh resources and fresh ideas. We have been continuously recruiting. It’s ongoing. We are also looking and always hoping to find Cinderella and then compromise for something less. The reality is we are just going to keep stealing back and forth from each other. (Laughs). How are your companies dealing with forecasting, whether in the short or long term? Lindquist: I see the furniture business going to, ‘Here’s an opportunity, do you want it or not?’ The new challenge is being able to react quickly enough to fill those needs. O’Brien: The one nice thing about the automotive business is you can anticipate your volume. It can always go (up or down), but you can plan for it within a range. But you’re still bringing on labor and equipment long before it is needed. The labor side of it can be six months. The equipment — based on launching the product and it having to go through validation — you have to onboard a year or a year and a half in advance before it actually gets put into production. Mellema: You can plan for the short- to mid-term, but it’s your long-term staffing and capital equipment needs that are a challenge. There is considerably more being asked of the furniture supply chain, from reporting to tracking the chemical composition of components. How are you dealing with those challenges? Mika: I’m one of the people who asks all kinds of questions all the time of my suppliers. I’m constantly receiving emails from suppliers asking about conflict minerals (because they’re getting the same question from several customers). That is just one small issue. That’s not even talking about quality issues. So just the reporting, the administrative side and the technical challenges that (Steelcase) is requiring are big deals. Lindquist: I had never heard of ‘code of conduct’ or ‘conflict minerals’ before this. They’re the new reality. How are you planning for growth in your industries? Lindquist: The challenge (with being a furniture supplier) is we are looking at the three Fs: fast, flexible and furious. A lot of the opportunities aren’t known today, as the OEMs scramble for new and different customers and new work. Who can react the fastest, get the customer satisfied and pull it off at the end? O’Brien: (Automakers’) programs have been delayed because there have been delays in product launches. I think there are 132 new product launches that took place this year across the OEs in the U.S. and I don’t think there is one that went off without a hitch. … I just don’t see, as you’re launching that many new products, that you are able to grow the market. I think we are going to play in the 16.5-17 million mark. It’s not going to go any further north than that. Nesky: Countries like Korea and Taiwan are hubs for medical device manufacturing. Issues with quality and supply chain efficiencies, however, are making Michigan attractive for companies looking to retool. But that costs around $150,000. … The conundrum (is that domestic companies) own the product but they don’t own the tooling. As motivated as they are to on-shore and manufacture domestically, it always comes down to overcoming the retooling cost. … If somebody could figure out how to work with these companies to re-engineer and retool for a reasonable cost, I think over the next decade, there is an opportunity for Michigan to take on those types of things. Just within our small consortium of companies there are more than a handful of companies that are expanding and are taking a bullish look at the market and (looking) to continue to grow and put the capital in to support that growth. How do you go about protecting against the downside? Nesky: We benefit by having things in the pipeline. We are a consulting business so we are similar to the construction business. If somebody comes to us and our pipeline is pretty full, we can quote a project fairly high. Then if we get it, sometimes we are happy, sometimes we are not, but we can also turn that pipeline back on fairly quickly. That is the advantage in our particular business. Buist: We have to have capacity all the time because as close as we are to our customers, we are still seeing two to four weeks out. That’s our lead time. I could get a project dropped in tomorrow that I quoted six or eight months ago that no one was talking about and all of a sudden I’ve got four weeks of work and I’ve got a week to do it. We have to have overcapacity in our equipment. We have a project right now where we made the prototype three weeks ago and I have to ship on Monday. We quoted the project, we made the prototype and we launch. That is just how it goes. You run it for six weeks and you’re done — on to the next (project). If there’s not a next one, well that is why we have overcapacity because we know those things are going to happen. Lindquist: We run about 50-70 percent capacity so that you have the ability to surge when you need to. On the downside, we try to run debt-free and keep the fixed costs at the very minimum. That way if you have to back up, which you unbearably do, you’re in (a position) to do that. Given the concerns over capacity constraints, how do you control growth? Mellema: We can be discreet and pick and choose business. What we are doing is choosing to limit our revenue growth so that our infrastructure can support it. (That) allows us to be a little more selective on our margins and pick the jobs that fit us better before we really let the dogs loose. O’Brien: We have a choice on the contracts we can choose or not choose for future business. We are working on 2016 contracts right now, so that is the model year we are into. But most of us are in capital intensive businesses. Having assets sit and not be utilized 24/7 is not an advantageous way to run our businesses. But once you get past break-even, your choices are a little more in your hands for which business you accept or don’t accept. Still, it’s tough to sit and watch a $20 million asset sit and only be used 20 percent of the time. It is a lot of money sitting there depreciating. What is the potential for M&A activity looking like in 2014? 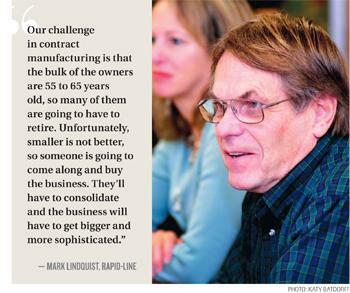 Lindquist: Our challenge in contract manufacturing is that the bulk of the owners are 55 to 65 years old, so many of them are going to have to retire. Unfortunately, smaller is not better, so someone is going to come along and buy the business. They’ll have to consolidate and the business will have to get bigger and more sophisticated. We are going to see a real consolidation as owners begin to retire. So you will see businesses that started out as mom-and-pop shops getting bigger, and they will have to decide if they want to grow through acquisition or not. O’Brien: Acquisitions are out there and at times, they are very affordable, but the challenge — as we have looked at several over the last 18 months — is deciding whether your organization is ready to take on something more. Many of the acquisitions out there are companies that are not in good financial position. So you can go grab them quickly, but do you have enough resources and depth in your organization to keep them running effectively? The depth you have really becomes the limiting factor to whether the acquisition will happen or not. The good part is that the banks are more than happy to lend right now. To what extent does the gridlock in Washington, D.C. affect your companies? Buist: I think it’s just the frustration. After a while, it starts to wear on you. I think everyone is just frustrated. Just set the rules and leave them alone. That’s the biggest frustration I have. Every year there is something else and you have to change your business or find a new way to work within the system. We’re all just trying to make money and provide jobs for our employees and provide to our customers what they want. O’Brien: It is largely a non-issue but the uncertainty drives consumer confidence down. Consumer confidence is what we all rally around for our products to move into the market. …As consumer confidence improves, products move. Editor’s Note: A previous version of this story misidentified Keith O’Brien from Pridgeon & Clay.